There are many types of ants that can create major problems for your home. Although there are many different types of ants that pose individual issues, there are many common themes can create a huge headache for you and could potentially cause major issues for your residents. Ants can enter through the smallest cracks, that are often hard to see. Many times ants are seeking water, greasy and sweet foods that may be left out around your home or improperly stored in your kitchen. Scent trails are also a reason ants may enter your home. When ants travel they leave a chemical scent trail that humans are blind to which contains pheromones that other ants will then follow to the original food source. 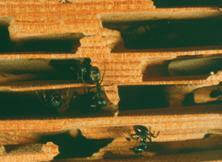 If ants have been inhabiting your home for awhile, it is likely that there may be a nest area. Ants can nest almost anywhere in and around your house in lawns, walls, stumps and even under the foundation. When nesting ants are amongst your home, this can mean their is a potential of up to 300,000 to 500,000 and colonies can move and relocate very quickly in other places in or around your home if disturbed but not adequately exterminated. Many people might think ants do not have a long lifespan, but in fact a colony has on average a 15 year lifespan. As a result of the ant’s long colony lifespan, colony size and their ability to travel in large groups do-it-yourself and home remedies can oftentimes not resolve the issue. Or oftentimes many people think the colony has been destroyed when in fact it has only relocated. Ants have four distinct life stages, egg, larvae, pupae and adult. They go through complete metamorphosis and depending on the type of ant can either take a couple of weeks, or a few months. This allows ants to breed quickly and replace numbers that have been killed off from improper extermination. Ecotech is a trusted Minnesota company who understand the proper way to exterminate ants and also uses environmentally friendly chemicals that will not harm your family or your pets. We are trained to understand the differences in ant species and take the appropriate measures to exterminate each different type of ant and ensure you that there will not be eggs or larvae left behind. Furthermore we will cautionary steps to help protect your home or property from any future ant invasions.